The Dropbox Plug-in allows you to export photos from Adobe Lightroom directly to your Dropbox account. You may use the unregistered (free) version at no charge for a limited time (10 days), after which you have to register the plugin in order to continue using it. Otherwise, the demo version is a full-featured product and has no other restrictions. Fixed the issue with setting an expiration date for shared folder links (Dropbox Pro and Business accounts only). Export Dialog: fixed the issue with creating new folders. Publish Service: Reclaim Photos now runs correctly. Fixed the issue with creating folders that already exist on Dropbox. Export Dialog: fixed the "attempt to index local 'fh' (a nil value)" error. Now the plugin correctly handles the situation when the user exceed the storage quota at Dropbox. Fixed the issue with uploading XMP sidecars. Fixed the issue with having to re-authorize the plugin at Dropbox every time after restarting Lightroom. Added support for large files over 150 MB in size. Now the largest file you can upload is 2 GB. The default description of newly created publish services now populates correctly on the first save. Fixed "HTTP Error 400" when users choose the "This folder" option (in the My Account section) but leave the path blank. Publish Service: Added the ability to convert folders to "Super Folders" for managing photos AND other folders inside a single Dropbox folder, which Lightroom doesn't support naturally. Fixed "HTTP Error Code 400" error when filenames contain Unicode characters. Export Dialog: duplicate photos now handled correctly. Export dialog: fixed issues with folder caching. 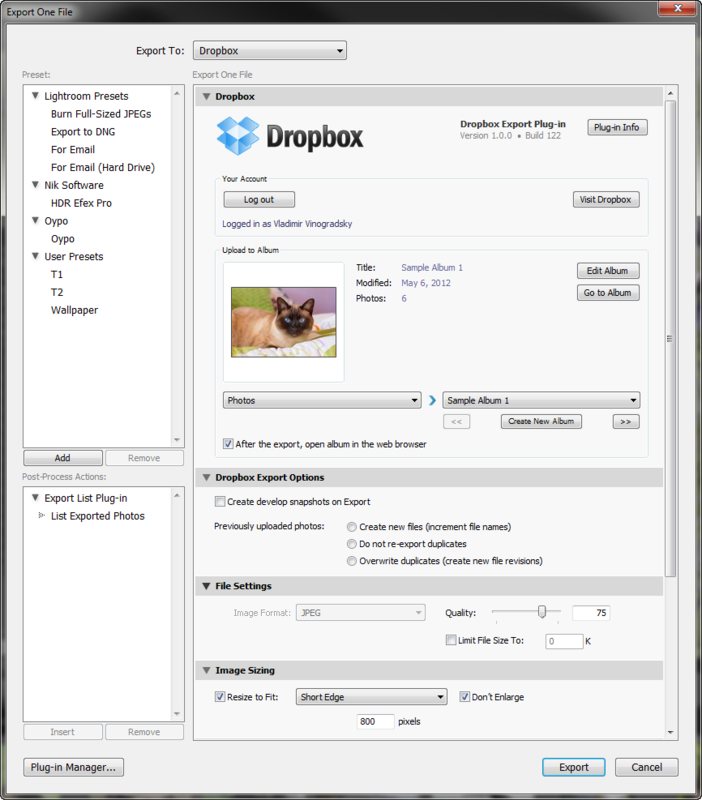 The plugin now uses Dropbox API v2. Users with Dropbox Pro or Business accounts now can password-protect shared folders and control expiration of shared links. Export Dialog: fixed the issue with displaying thumbnails for nested folders. Improved validation of the root folder selection. Publish Service: Dropbox metadata will be cleared when photos are removed from published collections. Metadata: The Photo URL link now forms correctly to take you to the photo preview page rather than containing folder. Metadata: Added the Album URL link. Import Albums - fixed the issue with displaying the number of albums imported from the server. Fixed the issue with uploading video files when the "Validate Image Size" option is turned on. Image Size Validation - fixed the "? :0: attempt to index a nil value" error when the rendition's size is out of acceptable range. Other stability fixes and improvements. Completely redesigned the automatic update mechanism. Export Dialog: implemented the ability to reload albums in a single folder. Fixed a rare phenomenon in which UTF8 encoding in watermark presets caused issues with creating and editing of albums. Export dialog: fixed the "attempt to index upvalue '?' 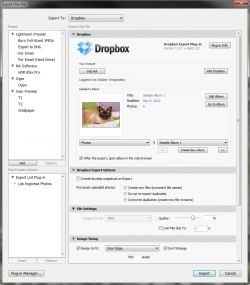 (a nil value)" error attempting to select a cached folder that no longer exists at Dropbox. Fixed the issue with uploading photos when the target folder's name contains special characters. Export dialog: improved validation of folder names. Fixed the "Bad argument #1 to "match (string expected, got nil)" error when Dropbox photos have no capture time information. Associate Images: now supports pairing by capture time. Associate Images: new option for resolving conflicts - use the last edited version before the upload. Fixed the issue with authentication in Lightroom 2 and 3. The authentication prompt appears less frequently. Export Dialog: some optimizations in the album caching mechanism. The plugin handles slower connections better and automatically extends upload timeout value when necessary. Now you can map the folder hierarchy to any Dropbox folder, previously there were only two choices: root folder of the account or the Photos folder. Added support for video uploads in DPX and original (unedited) format. Reclaim Photos: fixed an occasional deadlock situation when running Reclaim Photos using multiple threads. Implemented an alternative authentication method for folks having issues with automatic redirection from the web browser back to Lightroom after completing authorization at Dropbox. Reclaim Photos - now creates folders on the hard drive to match the hierarchy of Dropbox folders. Export Dialog: Fixed a rare occasional reset of the album cache. Fixed the issue with authentication in some situations. Users are required to re-authorize less frequently. Export Dialog: fixed a minor issue with the layout under Mac OS. Export Dialog: fixed a rare issue with the gallery menu staying grayed out. Puiblish Service: fixed the issue with using global watermarks in folder-specific settings. Improved validation of folder names to prevent the & character, which causes name truncation at Dropbox. Fixed the issue with publishing. Added a configuration option allowing to suppress upload errors until the very end of export operations. Export: Large uploads didn't respect the "create new files" option. Fixed the issue with dropping suffixes from filenames when the name contains a period. Fixed the issue with video uploads. Improved name sanitizing for exported files. Changed terminology (albums - folders) to avoid confusion with the new "Albums" feature of Dropbox. Require to re-authenticate less often. Publish Service: album-specific resolution settings didn't stick. Export Settings: added low/high pixel threshold options for validading image size. Fixed the "Unexpected Server problem http Error Code 400" error when uploading photos. Added support for extremely large files (over 150 MB in size). Added the "Validate Image Sizing setting" option controlling the "Oversized Image" warning during the export. Updated authentication mechanism from OAuth 1.0 to OAuth 2.0 for better performance and easier operation. Added support for DNG uploads. Implemented automatic handling of XMP sidecars when uploading images in camera raw format. Export Dialog: The "New Album" doesn't display an explanatory error message when the Create button is disabled. Export Dialog: Minor fixes and improvements of the album caching algorithm. Export Dialog: fixed the issue with creating subfolders. Publish Service: Improves support for watermarks when Lightroom presets are stored with the catalog. SSL Vulnerability detection dialog - fixed the error after applying the solution. Export Dialog: possible stack overflow when reloading the folder hierarchy from the server. Export Dialog: newly created album does not show up in the list. Export Dialog: album disappears from the list after running the export. Fixed an intermittent issue with authenticating the user. Export Dialog: Fixed the "attempt to call method 'addSessionAlbum'(nil value)" when creating new folders. Export Dialog: new Quick Filter feature which enables you to search albums using a text string. New Album Dialog: Now you can paste the name of the currently selected folder or collection with a single click. Implemented throttling of the rendering queue to protect against high disk space consumption during large exports (Lightroom 5). Export Dialog: implemented persistent caching to minimize server requests when loading folder information. Export Dialog: now displays progress information showing the number of folders retrieved from the server. Export Dialog: fixed the "The requested resource no longer exists on the server" error when the selected folder contains raw images. Export Dialog: album thumbnails sometimes do not show up (Windows, Lightroom 5.6). Improved verbosity of error messages when authorization fails. My Account section: now displays space utilization info. Export dialog: redesigned navigation between foldersFixed the issue with switching account information when working with multiple publishing services configured for different accounts. Fixed: chosing the "Only the Photos folder" option when the folder doesn't exist at Dropbox may cause a "The requested resource no longer exists on the server" error. Fixed the issue with switching account information when working with multiple publishing services configured for different accounts. Fixed "HTTP Error 403" during authentication. Fixes issues with the automatic update mechanism. Publish Service: fixed the error when creating albums within album sets. Publish Service: fixed the "attempt to compare string with number" error when using album specific resolution settings. Fixed the iusse with authorizing the user in some cases. New major feature - Reclaim Photos. This feature enables you to download photos from Dropbox to your hard drive. Export Dialog - fixed the issue with navigating to the top folder in the album hierarchy. Added support for print resolutions. Fixed the issue with applying automatic plugin updates. Fixed the issue with creating multiple publishing services for different accounts. Fixed the issue with creating shared album links. Now you can choose a color space when uploading photos. Fixed the "Access to an undefined variable: params" error when creating public links for a photo. Now the plugin can resume connection with Dropbox after a long period of inactivity. Fixed: Unable to create albums at the top level. Fixed: The plugin is asking to login every time on Export. Now you can upload RAW files. Export Dialog: fixed the issue with creating albums at lower levels of the album hierarchy. Export Dialog: fixed the issue creating new albums when there are deleted albums in the folder. Fixed the issue with republishing photos after moving albums from one parent album to another. Fixed the issue with publishing to albums that were deleted from Dropbox. Improved the handling of large uploads. Fixed the "You do not have enough permission on the server to access this function. Access has been denied." error when there is no Photos folder in the account. Publish Service: now you can customize metadata and watermarking options individually for each album. Now "Export with Previous" after creating new albums works correctly. Fixed the "attempt to index a nil value" error when using a particular combination of album-specific resize options. Added the ability to upload photos in their original format (without applying any conversion or resizing), provided the photos are already in the supported format (JPEG or TIFF). Opening the Lightroom Publishing Manager panel and logging into Dropbox no longer triggers the "Not Saved" status unless you actually modify one of the publishing options. Extras - Import Album Structure now works much faster, especially with a very large number of albums in the account. Publish Service: now "Check Photos" clears Dropbox Metadata fields if photos are no longer published through the Dropbox publishing service. Added support for the TIFF format. Added the option to manage all Dropbox folders as photo and video albums. Extras - Associate Photos: Added a new method of resolving conflicts - now you can prioritize pairing of rendered copies (JPEG and TIFF) over raw originals. Added support for video uploads. Export Dialog: fixed the issue with renaming albums. Added a safeguard against the situation when the Photos folder is missing. Improved the validation of album names for leading or trailing spaces. Improved the handling of server errors when you attempt to create an album with a duplicate name. Publish Service: Fixed the issue with moving albums between album sets. This is the first official (non-beta) release of the plugin. Extras: Added the ability to "Associate Images" in selected albums only (as opposed to all albums). Fixed a few compatibility issues with Lightroom 2. Fixed the error when attempting to create a new album and there are no photo albums in the account. Fixed the error with renaming published collections. Improved handling of deleted albums. Authentication: The "Token is not an authorized request token" error when the user attempts to proceed before completing the authorization process at Dropbox is replaced with a more meaningful message. Implemented validation of album names based on Dropbox recommendations. Export Dialog: Fixed the "attempt to yield across metamethod/C-call boundary" error in some situations. Export Dialog: Fixed related error "We can only wait from within a task" in some situations. Publish: Photo URLs for "Go to Photo in Dropbox" are now generated correctly. Export and Publish: Added the ability to create album links for sharing. Publish: Added the ability to create photo links for sharing and direct access via "Go to Photo in Dropbox". Export Dialog: Improved the UI for creating nested albums. Improved performance and eliminated unnecessary server operations. Fixed the issue with using Unicode and control characters in album names. Export Dialog: fixed the error when switching export destinations using the "Export To" drop-down list. So just to clarify: Its a beta version you are asking people to test yet in order to fully test all the functionality you want them to spend $15? Sorry about the confusion. I am going to address the limitation of the unregistered version for beta testing in the next couple of days. This is in the nature of the Export functionality – it’s basically “upload and forget” kind of action. There is no two-way synchronization. If you are going to use publish services, then you should be using them exclusively – this is how pretty much every publishing plug-in in Lightroom works. The Dropbox plug-in actually goes one step further. It offers an option to synchronize online photos with your catalog – in other words, automatically populate published collections with photos that exist in the Dropbox account. However, the photos have to be in the catalog (and they have to be named identically) in order to be synchronized. Build #145 (just uploaded) has a 45 day expiration period and no other limitiations. I apologize for the earlier confusion. I'm confused about the functionality… Wouldn't exporting to your Dropbox folder via regular export do all this… Why a plugin? I know there must be something I am missing, but can you explain? As I explained in a previous comment, the reason for the plugin is the ability to use publish services in Lightroom 3 and 4. Just like with any other publish service in LR, you can maintain a hierarchy of collections and smart collections in Lightroom’s catalog and automatically propagate all changes to your Dropbox folder. So, apart from that your plugin can also import existing photos in Dropbox, the functionality is already covered in the "Collection Publisher" and "Folder Publisher" plugins by Jeffrey Friedl (http://regex.info/blog/lightroom-goodies/facebook). Starting with version 1.0.2 you can also create links for sharing albums and individual photos right from the plug-in. I need to be able to export Tiff and Raw files to DropBox. Will your plugin include that capability? I am trying to figure out how to approach this. The problem is that the default destination for photos (i.e /Dropbox/home/Photos) won’t work because Dropbox can’t display raw or TIFF files. Therefore, they can’t be treated as “photos”. Sounds like the target folder for those formats would have to be outside of the Photos folder. I’ll have to think more about that. Any suggestions are welcome. The "File Settings" in the plug-in settings do not allow any other file format than JPG. What if a client wants the photos in TIFF which is not uncommon? (… or any other file type.) This makes this basically lovely plug-in pretty useless to me unfortunately. The "Image Size" in the plug-in settings do only allow "pixels" as a dimension option. Would love to see there cm/mm. The only reason I didn’t add the option to upload TIFFs was because Dropbox cannot display them. However, if this is not a problem, I can easily add support for other formats as well. I don’t quite understand how your client would be able to preview them. Please explain how you envision the workflow here. Thanks! Its not cear to me how I import the current dropbox file structure into lightroom/dropbox publish services. Go Library > Plug-in Extras > Dropbox Export Plugin Extras, then choose your Publish Service in the drop-down list and do "Import Album Structure". Just purchased this. I cannot see Dropbox Export Plugin Extras in my Plug-in Extras folder…? There are multiple Plug-in Extras menus in Lightroom. Which one are you at? You should be in Library > Plug-in Extras, not File > Plug-in Extras. Image sizing is disabled. A restriction of the trial or not possible at all? There is no functionality restrictions in the trial (except for the 10 days trial period limit). Did you select the “Resize to Fit” checkbox? If the box is cleared, the image sizing options are disabled – this is the standard LR behavior. Do you intend to support publishing video's in the future? I don't need them to be re-encoded, I just need the originals to export along with the images. Just downloaded the demo, it is just what I needed! I don't know if it's possible but I would love to se an edition to the plug in that allowed choosing different export settings for different folders. There are of course ways to get around this anyway but there're all a bit of a hassle. In the plugin, under Dropbox Publish Options, there is something that says, "Use Dropbox folders to manage your photo albums:" with two choices, "Only the Photos Folder" and "All folders in the account". The problem I'm having is that this whole section is greyed out so I can't change the selection. What do I need to do to make that active so that I can choose the "All folders in the account" option? Currently these options are available only in registered copies of the plugin. I am going to address that in the next update. we just downloaded the dropbox export plug in on a MacBook Pro ~ the installation was complete, 'allegedly' installed on the hard drive BUT it is nowhere to be found ~ does this plug in go some place that is hidden or does anybody have an idea what could of possibly happened to the plug in??? when we looked in the lightroom library >plug in extras & it was not there ~ please let me know what we should do next??? Most likely you had Lightroom running while installing the plugin. Simply restart Lightroom, then review the usage scenario at http://alloyphoto.com/plugins/usage/ – it provides an overview of Export and Publish facilities in Lightroom. I would love to say yes, but unfortunately it’s a no. Even worse, there is no built-in mechanism for converting folders into collections (or publish collections). This is a Lightroom concept – use folders to organize files on the hard drive, and use collections to organize photos into albums. I just have to say thank you so much for creating an awesome plug-in! I export ALOT of pictures all day everyday and at the rate I am doing it, I have to export and upload straight to dropbox or else all of our computers at our studio would be full on their hard drives. They fill very quickly… I have been looking for something to help us with this problem and I’m pretty sure I just found it! So thank you! I do have a question though. Right now I am in the testing stages of this plug-in to see if it will work exactly for what we are needing. So far 3 (pretty major) things stick out to me that may need to happen before we introduce this plug-in at our multiple studio locations. 1: Adding in DNG to the list of files that you can export to Dropbox. That would be awesome! It is a major part of our workflow at our studios and would be much appreciated. 2: Is there a way to make it so that you don’t have to refresh the Album list every time you make a new folder or album within the plug-in? I love that you can create a folder and album in the plugin but it seems a bit tedious and slow to refresh every time after creation. Maybe a refresh in background feature would be cool if it was possible and would help with the flow. 1. This is where you use the “ORIGINAL” option for the Image Format setting. This uploads original files without any conversion – whether they are in NEF, CR2, or DNG format. 2. I suspect you are using the Export facility, which is better suited for smaller folder structure. I recommend managing a large library via the Publish Services feature – you gain more control and more automation. Although even with the Export dialog, when you add a new folder it should automatically appear in the list. Perhaps you had to refresh because the folders were added by another user? 3. Upload speed depends largely on two factors: whether you are sending original files or rendering to JPEG or TIFF (rendering takes a lot of CPU power), and upstream connection speed. You can submit your debug log so I can tell you precisely how fast your files are being uploaded and compare it with the theoretical bandwidth of your upstream connection. As soon as I get a minute at the studio, I will message you with that info. I would love to hear the final resolution to Jim’s post, I have a similar idea in mind for my own workflow. Basically my computer and external drives are at capacity and I need to be able to catalogue everything in Lightroom but cannot fit everything locally on my drive. More external drives are not an option, they are unpredictable. I see that via Dropbox’s “Selective Sync” you can specify which top level folders will stay on your drive and which will remain only on the cloud. I need a way to have Lightroom access images that are only on the cloud. So the way it would work in my mind is this: I go out and take some pictures, come back import them into Lightroom, which will then archive them according to the date-specific folder structure like it normally does, but instead of it going onto my HD it puts it straight onto cloud-only folders in dropbox via the internet. I’m aware that this would mean that I would only be able to access these files with an internet connection, however the actual Lightroom catalogue would still be stored on my drive (although within the Dropbox desktop app and synced to Dropbox as well), so the changes made to those files would be saved whether I was connected or not. The next time I connect, Lightroom would update the files on the cloud from the info in its catalogue. There was no further communication regarding that post. I assume Jim was satisfied with my response as he ended up purchasing the plugin. But it sounds like you are looking for something different – you want imported images to reside at Dropbox as if it was an external drive. I don’t believe that’s possible because Lightroom expects all catalog photos to be stored on a local file system or on a local network. Your best bet is storing photos on an external drive and publishing them to Dropbox as originals. Even if your hard drive goes bad, you can pull original files from Dropbox back to your PC. The plugin offers a “Reclaim Photos” facility to do that. Thanks for the response, yes you’ve got the idea. Using an external as an intermediate platform linking Lightroom and Dropbox..well it’s not was I was hoping for but definitely sounds like it is worth a try. Cheers! Any plans for a similar plugin, but for Google Drive? I really need to have the plug-in export as DNGs. Other than that, it is perfect! Is there anything or anyway to make that happen? I tried using the originals but that is just not what i’m looking for. Thanks! Sounds like a good feature request 🙂 I’ll put this on my list. The feature is now available in 2.3.0. And for desert there is added support for XMP sidecars when uploading in camera raw format. Thank you Vlad! You are always so good at responding so quickly and trying to help in any way. I love it! Vlad, You are the BEST!!!!!! Thank you so much for the awesome new features!!! Seriously, so awesome….. Thanks! I just paid the $15…got it loaded to lightroom but It will not authorize/log in no matter what I do – it just hangs. This sometimes happens when Lightroom loses its URL handler allowing the web browser to pass control back to Lightroom. You can either reinstall Lightroom and try again, or change the Authorization Method from Automatic to Manual. really suggesting to reinstall lightroom…that is crazy – I will try manual but that should not be required. Ok manual worked… as long as thats a one time deal – i am ok with it. The fact is, when you uninstall an older version of Lightroom after installing the latest, the installer may remove the association of the internal protocol that’s required for web browsers to pass control back to Lightroom. Without this, automatic redirection can’t work and there is nothing plugins can do about that because this happens on the OS-level. Also I know for a fact that reinstalling Lightroom isn’t a big deal – it keeps all of your catalogs and preferences intact. Please be aware that I am trying to help you and explain things – there is no reason to be rude.